There is a right way and a wrong way, strangely, to call for the elimination of Israel. 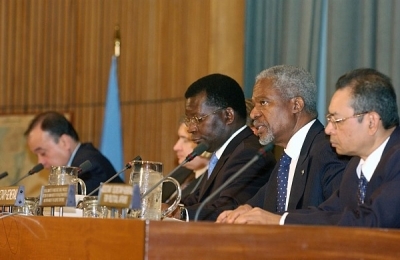 The secretary-general of the United Nations, Kofi Annan, provided an example of both ways in recent weeks. When the president of Iran, Mahmoud Ahmadinejad, stated on October 26 that "the regime occupying Jerusalem must be eliminated from the pages of history," Mr. Annan replied by expressing "dismay." Again on December 8, when Ahmadinejad called for Israel to be moved to Europe, Annan responded with "shock." But dismay and shock at Ahmadinejad's statements did not prevent Annan from participating on November 29, just between the Iranian's outbursts, in a U.N.-sponsored "International Day of Solidarity with the Palestinian People." Anne Bayefsky of "Eye on the UN," reports that Annan sat on the dais with an Arabic-language "Map of Palestine" nearby that showed a Palestine replacing Israel. It cartographically achieved exactly what Ahmadinejad called for: the elimination of the Jewish state. Maps that do not show Israel. Fatah and Hamas together display this dichotomy. Both aspire to eliminate Israel, but they have chosen different paths to get there. Fatah's tactics have been opportunistic, duplicitous, and inconsistent since 1988, when Yasser Arafat nominally condemned terrorism and began the "peace process" with Israel – even as he simultaneously sponsored suicide terrorism and promoted an ideology totally rejecting Israeli legitimacy. This transparent deception enabled Fatah to gain great benefits from Israel, including a self-governing authority, a quasi-military force, vast Western subventions, and near-control of one border. Hamas, by contrast, consistently has rejected Israel's existence, which has won it ever-larger segments of Palestinian Arab public opinion (the latest poll shows it ahead of Fatah in the forthcoming elections, 45% to 35%). But this overt rejectionism also has made it anathema to Israel and others, limiting its effectiveness. As a result, Hamas in recent months has started showing more flexibility; for example, it generally has honored a cease-fire with Israel and is moving in the direction of entering the diplomatic process. This brings advantages; the "Conflicts Forum" and others, with some success, are presenting Hamas as a newly legitimate interlocutor. Palestinian Islamic Jihad might find itself the only purely rejectionist organization against Israel. Why do such distinctions in style matter? Because the Fatah approach seduces Israelis enough to work with them; Arafat-like euphemisms, inconsistencies, subterfuges, and lies encourage them to make "painful concessions." Contrarily, the Ahmadinejad-PIJ approach crudely confronts Israel with overt and brutal threats that cannot be rationalized away. Blatant calls for Israel's disappearance make Israelis bristle, acquire new armaments, and close down diplomatically. These ploys might strain credulity – surely the Israelis realize that the former is no less lethal than the latter? Actually, they do not. Since 1993, Israelis have shown themselves, in the words of the philosopher Yoram Hazony, to be "an exhausted people, confused and without direction," willing and even eager to be duped by their enemies. All they need are some overtures, however unconvincing, that they will be freed from war, and they barely can restrain themselves from making concessions to mortal enemies. 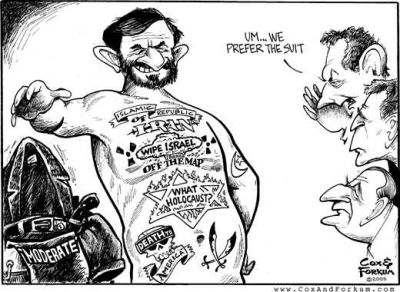 Thus does enlightened world opinion condemn Ahmadinejad, sensing he went too far and will cause Israelis to retreat. If he would only tone down his comments and politely call for Israel's elimination by, for example, endorsing a one-state solution, all would be well. Thus have Israelis effectively defined which anti-Zionism is acceptable and which is not. Kofi Annan's record of both condemning and endorsing Israel's elimination merely reflects the etiquette of destruction established by Israelis themselves. 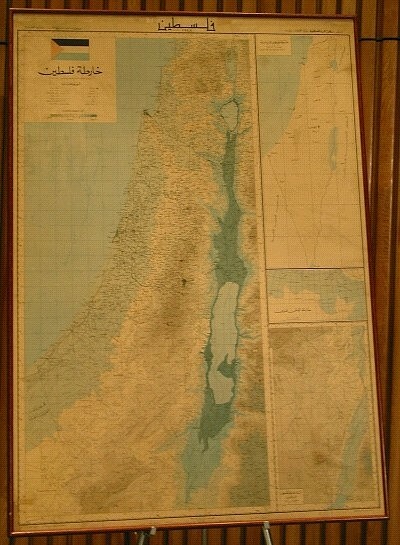 "Map of Palestine," as displayed at the United Nations on Nov. 29, 2005. Kofi Annan, second from right, sits on the dais with the "Map of Palestine" that eliminates Israel's existence in the background (far left). Dec. 16, 2005 update: Many of the comments below take this article as a launch pad to express their hostility to Kofi Annan or the United Nations. While I share that hostility, it is not the point of this article, which notes that Annan is following the peculiar rules Israel has set down.